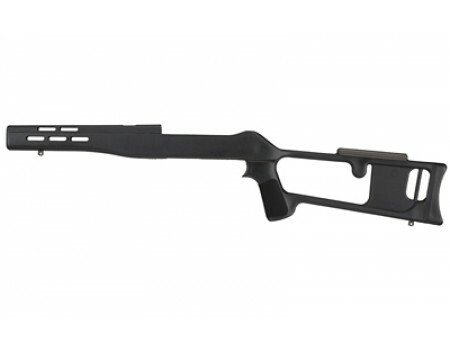 The Ruger 10/22 Fiberforce Stock by ATI features the lightweight Dragunov 22 design, made of Dupont Extreme Temperature glass-reinforced polymer, and is intended for use with open sights or a scope. Weighing only 26 ounces, this weatherproof stock features a ventilated forearm and handguard, a built-in cheekrest with a 3M Soft Touch cheekrest pad, and sling swivel studs. It fits most Roger 10/22 models, but will not accommodate rifles equipped with bull barrel.